I was reading a post by the WoW Noob today, and I liked her screenshots of what choices she’d made so much that I wanted to post my own current stylish fashinista statements too. First, my Druid. 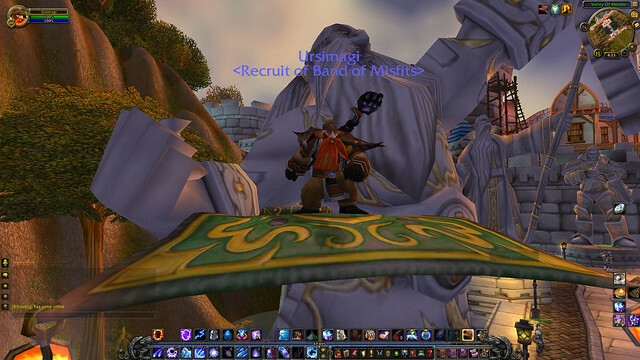 I love the look of my Druid, I really do. I love the Sporeggar tabard, hair and gear color blending. Plus, shrooms! Considering I like to try to make everyone’s life a little more surreal, I think a mushroom makes for a great icon. Yes, I am proud of having almost gotten 100% of the Firelands tier. I’m just missing the shoulders, and the ones I’m sporting actually blend in pretty well. 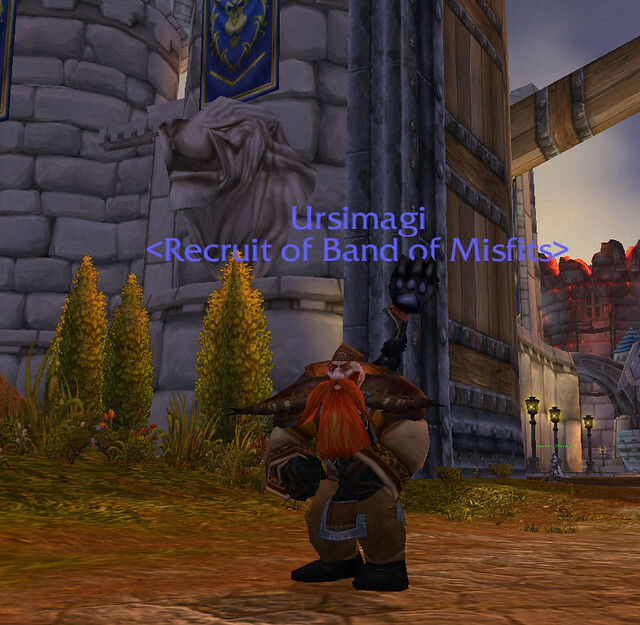 And I am enjoying an embarrassment of riches, having both the staff AND the bow from Dragon Soul LFR. I’m not sorry. After that must come the infamous Arms Warrior, sporting the very latest in OMG WTF is THAT? I did subtle on my Druid, I did raiding on my Hunter, but for my Warrior I went for making a bold, offensive eye-searing statement. If you have screenshots of your own looks, by all means, shoot me a link in the comments to whatever site hosts them, or blog post you made with them. 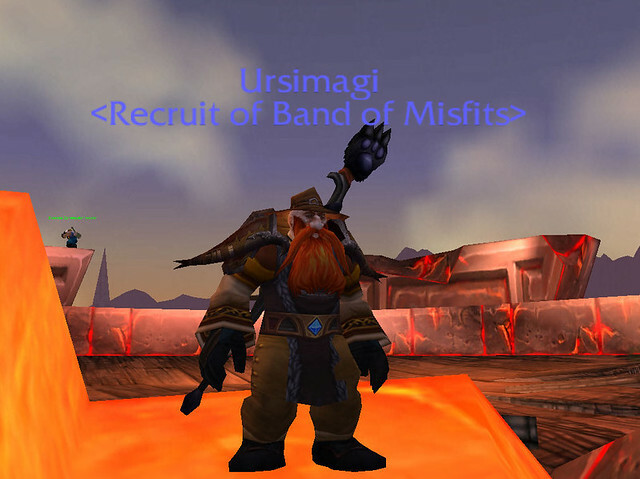 I’d love to see what you actually wear around Azeroth! If you’re doing SW:TOR instead of WoW these days, you’re not left out… if you’ve got a screenshot of your favorite character looking badass, link that too! No screenshots unfortunately, but I’m sporting different outfits on 2 characters. I have Skyshatter on my shaman, although I’m collecting Worldbreaker for my Enhancement gear. Also got the Claw of Molten Fury from Mount Hyjal in the first run, still hoping for the Fist to drop. Would be an awesome combination. I actually love that you’re not using FL-model shoulders for the hunter’s set. I liked hunter T12 except for the shoulders/hat, and the shoulders you’ve picked out let you keep the cool parts of T12. 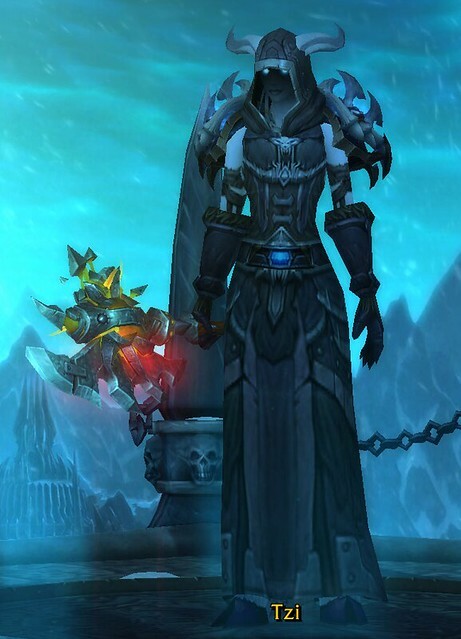 One of my guildies makes fun of my transmog set for my hunter, saying that I’m making her look like she’s level 42. I agree that I don’t like the looks of the hat and shoulders. But that doesn’t mean I don’t WANT the shoulders to complete the set. 🙂 I do have the hat, but what I’d like to do is get out there and find a really nice eyepatch. This site has an amazing range of outfits – both costume and transmog sets. The horde druid is straight blue all the time! ooh, that is pretty! I’m used to a strong red element in the shoulders on Alliance side. Can’t go wrong with purple for Night Elves! Purple was the main theme of my kitty set with some green details. Healing sets for both druid and priest are blue since that’s my favorite color and that’s what I’m looking at 99% of the time. If I get around to finishing my shaman’s set it’ll probably be blue too. The priest isn’t terribly original but I do like my mace (I’ve got Redemption in my bags just in case I wind up with a staff in the future). 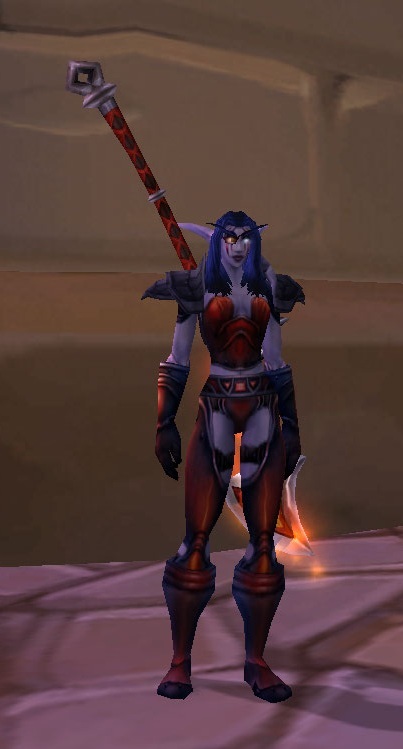 My shaman, Beltrine (on aman’thul I’d you’d like to have a look) is wearing the Scarlet Monestary set, including Herod’s Shoulder and Ironspine’s Fist. Sadly, she lacks the chest and boots, but I worked around that with careful selection of greens and shirt. Itself again I would be very happy. I’m a bit of an outfit hoarder, just one of my favorite things in WoW. I have switched between http://i.imgur.com/zL0FJ.jpg and http://i.imgur.com/1Dsij.jpg , and have another for pvp http://i.imgur.com/1vNKK.jpg . All the outfits, I need a bigger closet. I really like your druid’s set, I’ve thought of farming that up as well on mine, purple hair, purple cloths? awesome. And you can’t go wrong with bright BC colors, unless you mix and match a ton. I love the middle one of you on a magic carpet in front of the dwarf statue… dressed like an archeologist. I told my 8-year-old that if he hit lvl 70 through quests and instances without power leveling, then I would run him through some lvl 70 raids. He did so a couple weeks ago so I have been solo’ing the lvl 70 raids and heroic outland dungeons with him in tow. Not for xp, mind you, but for gear. We went through all the lvl 70 raids and heroic dungeons and he got 3 bars because of the xp nerf. 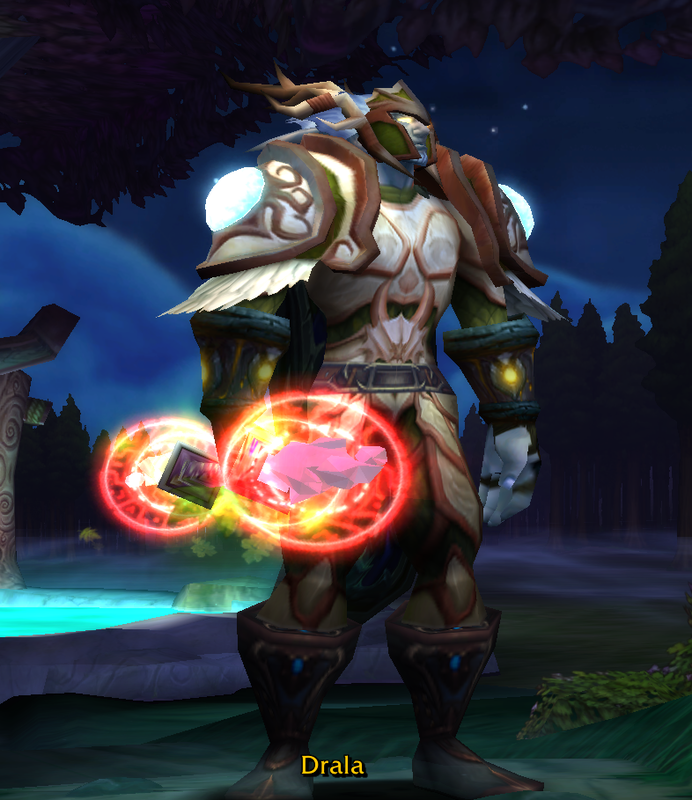 When the tier pieces started dropping and I saw that a druid could have antlers and that the chest/belt combo looks like a face, well, I was sold. So I started collecting. Took me two weeks to get all the tier markers from Kara, Mag and Gruul but it was worth it. Plus my son got a lot of his tier pieces to take into northrend with him, so . . .
Oooh! I love the staff contrast with your outfit, very cool. I never noticed the way that looks like a face, how hilarious. Grin and bear Tank it, as nashamire might say? Not the most eyecatching outfit but somehow I like tanking in a skirt. Actually, where do those shoulders come from? I’ve never noticed the slimmed down shoulders with razors quite like that before, that looks cool. Are those the first step of DK? Hah, they’re DK T13 tank. I was going to mog them then I got to Three Winds and realised they fit just fine. The rest of it is a mix of the blue/green starter DK sets, with an Elementium Specimen Slicer. It’s a very cheap outfit! Damn I want that bow! Nice outfits, especially the warrior…what’s his/her name? Candy cane?